The acclaimed production comes to New York…! Famous for his ranting style, Thomas Bernhard is widely regarded as one of the most provocative writers of the 20th-century. His plays, which explore social power dynamics, combine the angst of Samuel Beckett with the absurdist comedy of Eugène Ionesco. Bernhard was born in Holland in 1931 but grew up in Austria. A chronic lung disorder in 1948 led to his confinement in a sanitarium until 1951. In 1952 he enrolled in the Akademie Mozarteum in Salzburg in 1952 to pursue his interest in music and theatre, and graduated in 1957 with a thesis on Antonin Artaud and Bertolt Brecht. In 1965 Bernhard made his home on a farm in upper Austria where he lived reclusively until his death in 1989. He was the recipient of many international awards, including the prestigious Georg Büchner Prize. Bernhard’s many plays include Histrionics, Eve of Retirement, and The Force of Habit. One of his most celebrated novels, The Loser (1983), involves the iconic Canadian pianist Glenn Gould. 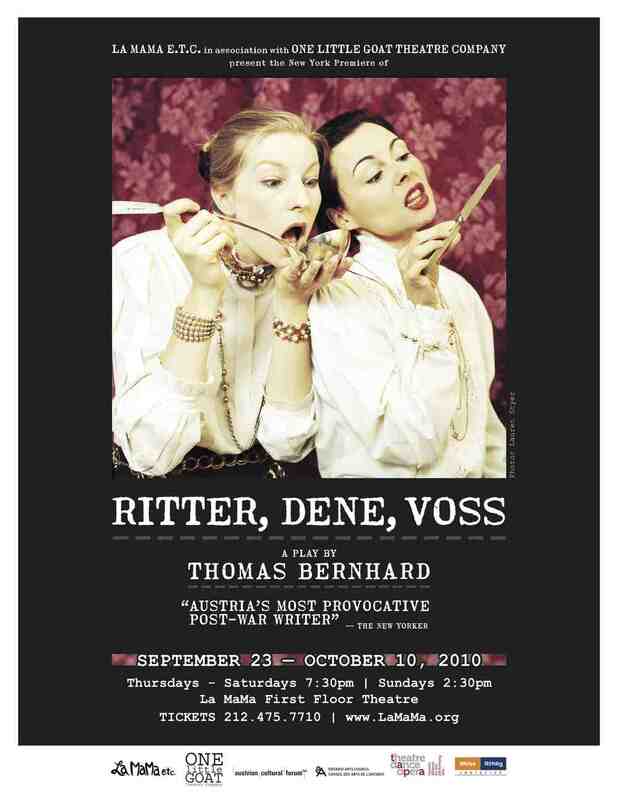 One Little Goat presented the English-language world premiere of Ritter, Dene, Voss in Toronto in 2006. Hailed by The Canadian Theatre Review as “flawless,” the production toured to Chicago’s Trap Door Theatre in December 2007, where Newcity Chicago ranked it as its #1 production. The play was first performed in German by Ilse Ritter, Kirsten Dene and Gert Voss at the Salzburg festival in 1986. It went on to be performed with the original cast at the Burgtheater in Vienna every two years for the next ten years.